The Chef server acts as a hub for configuration data. The server stores cookbooks, the policies that are applied to nodes, and metadata that describes each registered node that is being managed by the chef-client. 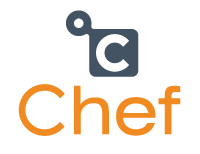 Nodes use the chef-client to ask the server for configuration details, such as recipes, templates, and file distributions. The chef-client then does as much of the configuration work as possible on the nodes themselves (and not on the server). This scalable approach distributes the configuration effort throughout the organization. Already being set up as Chef-Client. Workstation is already set up.